Was a goddess born when a black meteorite struck Earth? The mysteries of the Black Madonna can be traced to pre-Christian times, to the ancient devotion to Isis, the Earth Goddess, and the African Mother, to the era when God was not only female but also black. Sharing her more than 35 years of research and fieldwork at sacred sites around the world, Belloni explains how her love for Italian folk music led her to learn the ancient tammorriata musical tradition of the Earth Goddess Cybele and the Moon Goddess Diana and discover the still-living cult of the Black Madonna in the remote villages of Southern Italy. Belloni shows that the shamanic traditions of the Black Madonna are still alive today—and just as powerful as they were millennia ago. 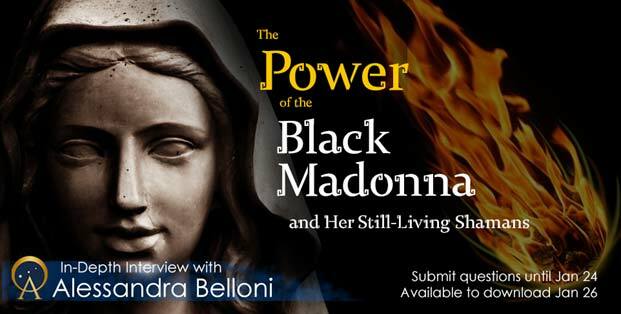 Discover the surprising ancient connections of the Black Madonna in this fascinating In-Depth interview with Alessandra Belloni. Join Ancient Origins Premium for the In-Depth Interview! Alessandra Belloni is a world-renowned percussionist, singer, dancer, and actress born in Rome. Voted one of the best female percussionists in the world by Drum Magazine , she designed a signature series of tambourines for REMO, Inc. She is the founder and lead performer of “ I Giullari di Piazza ,” an Italian music, theatre, and dance ensemble, and is an Artist-in-Residence at the Cathedral of St. John the Divine in New York City. She teaches workshops and healing retreats around the world, and is the author of: Healing Journeys with the Black Madonna – Published by Inner Traditions. The book explores the many sacred sites of the Madonnas and connects them to other Great Goddesses, such as Isis, Aphrodite, Cybele, and the Orisha Yemanja and Ochun. Get your questions in before January 24! We will ask the expert for you. As a Gold Member you get to submit your questions or points in advance. In-depth Interviews are pre-recorded, and then are available to watch at a time that’s easy and convenient to you. This Interview will be available to download from January 26.